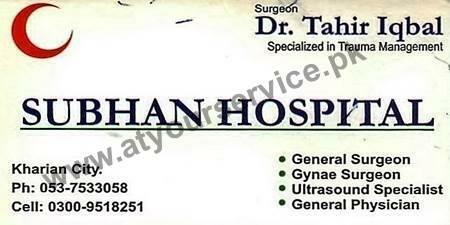 Services of Trauma Management Specialist, General Surgeon Doctor, Gynecologist, Ultrasound Specialist and General Physician Doctor are available in Subhan Hospital. Subhan Hospital is located in Dawood Rasha Plaza, GT Road, Kharian. Dr. Tahir Iqbal is specialist in Trauma Management. Services of General Surgeon Doctor, Gynecologist, Ultrasound Specialist and General Physician Doctor are available in this hospital.